(February 2, 2012)- The Cape Coral Police Department is partnering with the National Highway Traffic Safety Administration and the National Football League for their Super Bowl Impaired Driver Prevention Campaign. "The Cape Coral Police Department wants everyone to enjoy the Super Bowl on Sunday. 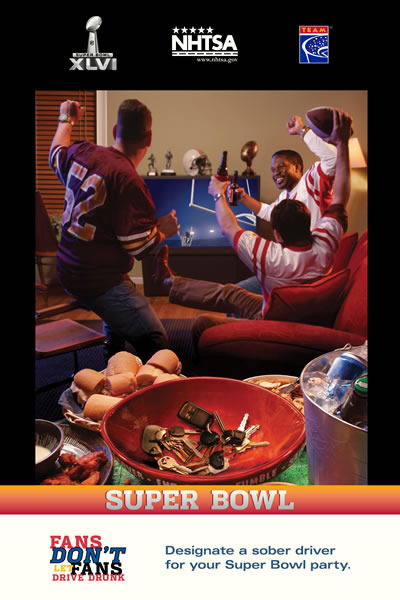 Whether you are watching the game at a sports bar or restaurant, or you are one of many watching at a house party; we want you to get home safe. Please designate a sober driver to take you home or call a taxi. "- Lieutenant Tony Sizemore. Ø Make sure all of your guests designate their sober drivers before kick-off or help arrange ride-sharing with sober drivers. Ø Only serve alcohol to guests over 21 years of age. Ø Be prepared for guests to spend the night if an alternative way home is not available.